This older Craftsman has been wonderfully refreshed. Everything has been updated, but the original charm is still there. A plus is the deck with both a view of the Strait and also of the majestic Olympic Mountains. 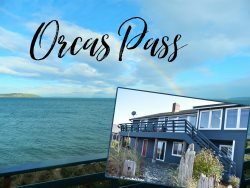 It is centrally located in Port Angeles with great access to the Olympic National Park, Victoria and all attractions along the Pacific coastline. Two bedrooms with one bath, comfortable living room furniture and relaxing atmosphere. The updated kitchen will allow you to fix a quick snack or a full meal. Enjoy an outdoor meal or just a cup of coffee on the wonderful deck and patio with great southern exposure. Take a stroll through downtown's quaint antiques and gift shops or enjoy the many restaurants, pubs, local breweries and coffee houses all just minutes from the home. Take a day trip to Victoria, BC on the Coho Ferry right from downtown Port Angeles, or experience a whale watching tour with Port Angeles Whale Watch Company. Come and experience the comforts of this adorable cottage while finding adventure on the Peninsula! No Smoking/No Pets/Children over the age of 6 years old welcome. There is NOT Cable or Satellite TV service at this home. Washer and Dryer available; Soap is provided. Parking available on street and also off of alleyway next to garage. No Garage Access. Very helpful, always ready to answer any questions or concerns, good advance communication. A lovely, lovely house, very well equipped, peaceful neighbourhood. The views of the sea from one window, while views of Olympic mountains from another; the lovely garden seating area, which was sheltered from the wind and almost always sunny. We thoroughly enjoyed our stay and if we were coming back to the American North West, we'd definitely stay in the same or similar property. Only really worked with at check-in. Loved it! Great value for a truly once in a lifetime experience with the family on the Peninsula. We LOVED the house. It was central to everything we wanted, easy to get to, nice kitchen, perfect size, etc. I wanted to steal the windows to bring home with me. What a great area. I'd never been to the Olympic Peninsula before and this area is perfectly located to explore the region. The value was great, also. We give this property an A. Great central location in quiet hillside neighborhood. Well appointed Craftsman style furnishings and decor. Adequate bedrooms and nice size kitchen with eating area. Deck with views of harbor and mountains in distance a plus. Highly recommended Sabai Thai restaurant around the corner but make reservations. Safeway and Country Aire (organic food store) are nearby. Entrance to Hurricane Ridge also close by. Amazing! Like new - quiet, spacious, elegant. Plus the folks at Brigadoon are always helpful Would definitely stay there again! This is our second time visiting the cottage house, and it was truly enjoyable. Loved spending time gazing at Hurricane Ridge, and relaxing with my sister while enjoying the sunshine! Discovered a wonderful nearby restaurant called Sabai Thai. We took a 16 mile bike ride from the Cottage to the Elwha River bridge. Hiked up Hurricane Hill to 5757 feet in the fog and lite rain to find sun, glaciers, marmots, deer, ptarmigan and views to die for.... Wonderful Seafood Market nearby, cooked fresh coho on grill on back deck watching the sunset. We could not have been more pleased with our lovely home, we walked in and instantly felt the warmth and care that this "cottage" had. Our morning coffee on the deck with a great view and our evening meals at the spacious kitchen table were perfect. It was a great spot to start our days adventures, hiking or going across the water for "high tea" , shopping or walking lavender gardens, it was all within an easy car ride. We would rate this a A!